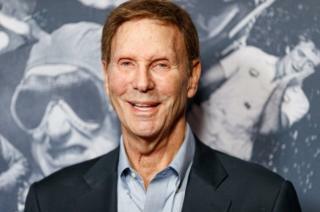 Veteran comedy writer and actor Bob Einstein has died aged 76, his brother confirmed on Twitter. Albert Brooks, who is also a comedian, paid tribute to "a great brother, father and husband" and "brilliantly funny man". "You will be missed forever," he said. Einstein was most famous for the role of Marty Funkhouser in the HBO satirical comedy Curb Your Enthusiasm, which he played from 2004 to 2017. He won fans portraying Larry Middleman in the third season of Arrested Development, and in Hollywood heist caper Ocean's Thirteen, where he played Matt Damon's con artist father. Einstein also created death-defying stuntman Super Dave Osborne, playing the character on sketch comedy show Bizarre, on Late Show with David Letterman, and eventually in his own series from 1987. Curb Your Enthusiasm: TV's most influential show? His TV writing included 1960s and 70s variety shows The Smothers Brothers Comedy Hour, for which he won an Emmy, and The Sonny and Cher Comedy Hour. Larry David, star of Curb Your Enthusiasm, said in a statement: "Never have I seen an actor enjoy a role the way Bob did playing Marty Funkhouser on Curb. "It was an amazing, unforgettable experience knowing and working with him. There was no-one like him, as he told us again and again. We're all in a state of shock." David's on-screen ex-wife, Cheryl Hines, also tweeted her condolences, saying: "We lost a friend today." Curb cast member Richard Lewis described Einstein as "excruciatingly brilliant" and "so loved". Star Wars actor Mark Hamill spoke for many fans with a simple Twitter tribute, writing: "Thank you for a lifetime of laughs, Bob Einstein."